Earlier this month we shared the news that our Junior Choices programme was awarded Community Project of the Year at the UKFast Community Education Awards. 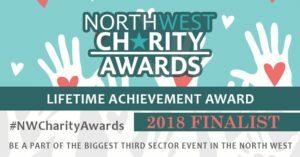 Now we’re on a roll and have been shortlisted for three more awards at the North West Charity Awards! Our second annual Reds v Blues football match pitted our supporters against each other to raise money for the Youth Zone with our very own Manchester Derby. Manchester City legend Dennis Tueart managed the Blues, and Manchester United star and current England Women’s coach Phil Neville managed the Reds to a close 3-2 victory. The match raised an impressive £40,000 for the Youth Zone, but for 90 tense minutes the teams played for pride, glory, and bragging rights in the true spirit of a Manchester Derby. One of our long-time supporters, MoneyPlus Group, has been shortlisted for their outstanding support of the Youth Zone. CEO, Chris Davis, is the Chair of our Board of Trustees and the Development Committee, a group of decision makers, entrepreneurs and business people from across Manchester. As well as donating financially, MPG also donate their time and effort to help the Youth Zone, including wrapping (hundreds of!) Christmas presents to give to our young people. We’re incredibly grateful for their support and pleased they have been recognised for this award. This nomination goes to our Chief Executive, Richard Marsh, who joined us 4 years ago. Before he came to the Youth Zone, Richard had worked with The Prince’s Trust and Lancashire City Council. He was responsible for ensuring that they had the resources to reach as many young people as possible. Richard has brought his experience and expertise to Manchester Youth Zone, and as our Chief Executive has developed partnerships with businesses and community groups so we are less reliant on local authority funding. This means that we are able to offer young people a wider variety of activities and targeted projects (such as Sports Leaders and Junior Choices) to get involved with! Richard’s passion for improving the lives with young people is inspiring – he has also spent his time volunteering with other charities, including ON-TRACK, a national charity working with “at risk” young people, and Nightsafe, that supports homeless young people in Blackburn. “My desire as always been, from my experience of working with young people growing up in places without opportunities, to make a difference to the lives of some of the most disadvantaged young people in the UK. I still have the same vision that I always have had – to change the lives of the young people with whom we work, to believe in them and to create opportunities for them. 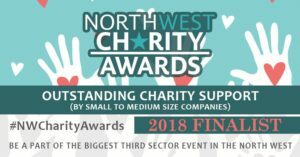 We can’t think of anybody more deserving of the Lifetime Achievement Award, and wish him – as well as MoneyPlus Group and Reds v Blues – the best of luck in the North West Charity Awards! 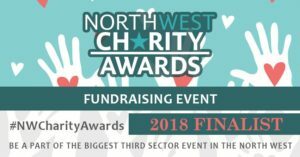 The North West Charity Awards Ceremony will take place on Friday 12th October 2018, so watch this space! To keep up to date with the (award-winning) Manchester Youth Zone, follow us on Facebook, Twitter, LinkedIn and Instagram!